Not specified in the Bible account above. General lighting, from above, illuminates this scene. The rider on the white horse. I have designed all four riders of Revelation 06 to appear in four different pictures, as there are many elements that I wanted to include, and I thought putting them all in one picture would make that scene far too busy and full! 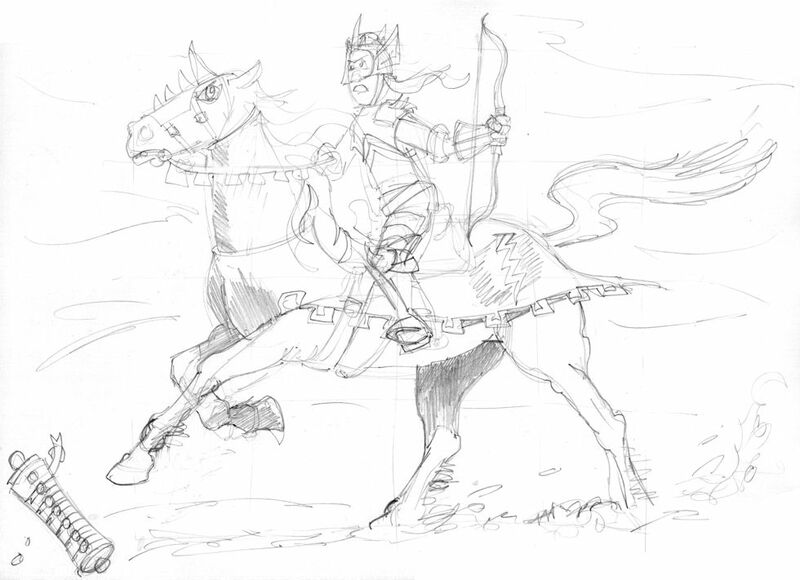 By drawing each of the four riders in separate scenes, the viewer gets to focus on each one I turn. Many artists group all four riders together into a single picture… perhaps I’ll do that in future versions. 01) (2 pages previous) Revelation 06 – The Scroll seals – Scene 01 – First seal: White rider (with scroll). 02) (Previous page) Revelation 06 – The Scroll seals – Scene 01 – First seal: White rider (without scroll). 03) (This page) Revelation 06 – The Scroll seals – Scene 01 – First seal: White rider (with people). 03) Revelation 06 – The Scroll seals – Scene 01 – First seal: White rider (with people). This version has the 7 seal scroll in the bottom left corner of the scene, with the first seal opened. 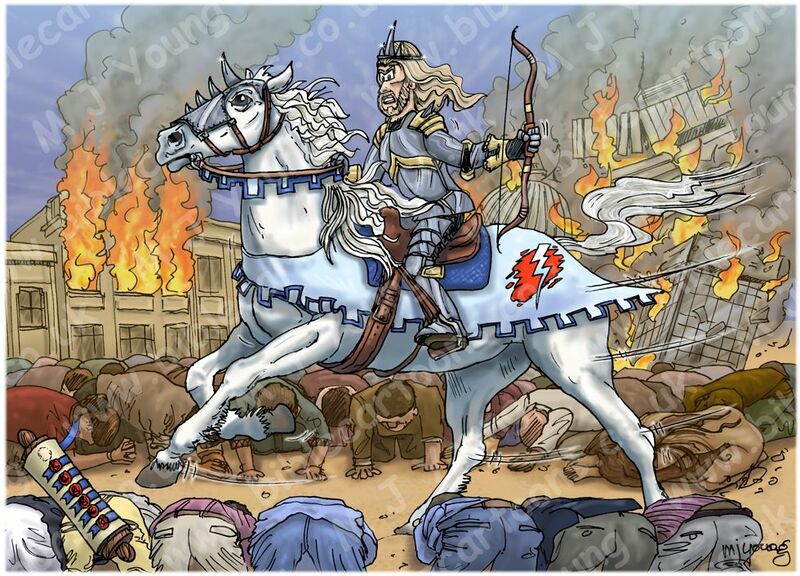 The background of this 3rd version of the white rider was requested by the lady in the USA who commissioned these “Riders of the Apocalypse” scenes. She wanted burning buildings, that were also crumbling and falling, and people bowing down in worship to the rider on the white horse. Since the rider is described as riding out as a conqueror bent on conquest, I decided to put him in steel armour. Notice the three point crown is worn on the rider’s head without the steel helmet (seen in the first 2 versions of this scene), which was a change requested by the lady in the USA. As with the other versions of this scene, notice that the bow has no arrow, which indicates that he will establish a world government without warfare. Some interpreters of Revelation have wondered if the white rider described in this passage is Jesus, at His second coming, due to similarities in the description of the horse and rider. However, the timing would be in the wrong order, as Christ returns to the earth at the end of the Tribulation, not at the beginning. In addition, the three riders on the other horses (Red, Black and Pale) obviously relate to destruction and judgment, which precedes the second coming of Christ, so the first white rider can not refer to Jesus. A better interpretation is that the conqueror described in Revelation 6:1 is the future world ruler, sometimes referred to as Antichrist, although Revelation does not use that word. 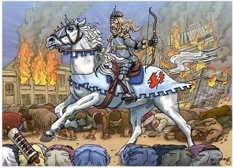 Although the future world government that the white rider users in begins with a time of peace, soon destruction follows (see 1 Thessalonians 5:3). The white rider is probably the same person as the ruler of the people mentioned in Daniel 9:26.